There are a variety of languages that Africans use in their daily lives depending on the region they are occupying and their heritage background regardless of the borders outlined in the map of the world that might include them within the same country. Sudan, the largest country in Africa and the home of the most recent Darfur genocide, is no different than the rest of Africa and have reported at least 100 different languages and dialects that are currently used by its citizens. Al-Fur “Fur” people in the western Sudan region have a unique and rich language of their own that developed along the centuries. 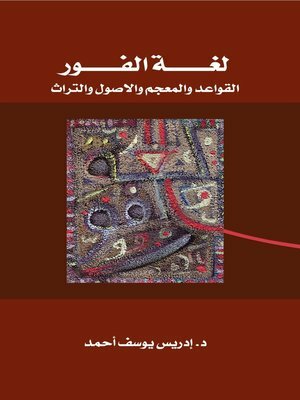 This book is the first representation and study of the language in Arabic language as well as a systematic and scientific fashion authored by an expert in the field and one of the region’s sons. The book consists of four chapters: grammar, dictionary, rules of the language, and culture. This study represents Al-Fur/Fur Tribe community with its complex divisions describing their intellectual, cultural, and linguistic interconnections and their development. Albeit, the book’s main objective is to describe the details of the language, it also incorporates, for the first time ever written and published, a lot of the region’s parables and fables that depict the lives of the people and what is important to them. Al-Fur Language is an excellent study of heritage of a region that has suffered immense blind discrimination in recent years. The book aspires to gain respect and understanding for the people of the region to aid international efforts for their rehabilitation and hopeful return to their homes. Dr. Idris Yousif Ahmed obtained his doctorate from University of Newcastle 1976. He has a number of publications and articles in international scientific journals, regional and local newspapers.